As an aviation writer, I’m always on the prowl for interesting approach charts (so if you have a favorite, drop me a line). 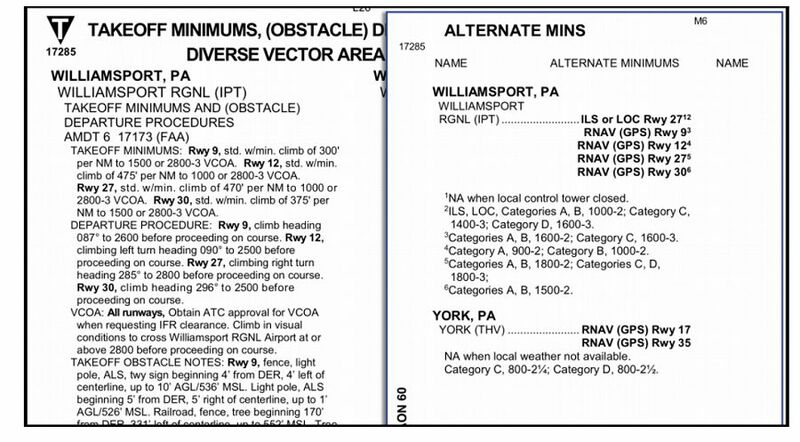 One that recently appeared in my email was the ILS or LOC Rwy 27 at Williamsport, PA (KIPT). The striking curiosity was plan view note, “RNAV 1-GPS or RADAR AND DME REQUIRED.” The investigation yielded a longer explanation than I expected. Too bad I don’t get paid by the word. This note says a transition from the enroute environment to the approach requires either an RNAV 1 level GPS navigator or you a combination of both ATC radar and DME on the aircraft. The lowercase “or” separating the two groups of capital letters means you can have either group of capitals. Don’t send an email if you find an example where these capitalization rules are broken. It’s not consistently employed due to evolving standards for this stuff, but that’s what it means. The ILS or Loc Rwy 27 at KIPT is hybrid of two approaches. It’s a conventional ILS with the terminal arrival area (TAA) from the RNAV (GPS) Rwy 27 approach grafted on. To transition from enroute to the localizer: Enter one of the three sectors at or above 4300 feet, fly to the initial approach fix for that sector (ZEKNO, JIBGO, or HULRO), intercept the localizer and cross JIBGO, and descend to cross the final approach fix of ZUMEY at or above 3700 feet. There’s no course reversal charted because there’s no direction from which a procedure turn is required, or for that matter, allowed. Don’t let the “RNAV 1” part trip you up. For our purposes in GPS-driven GA, this means any terminal certified GPS, which must be accurate to within one mile a minimum of 95 percent of the time. If you have an approach-certified GPS, you’ve got at least RNAV 0.3, which is more than three times an accurate. With that navigator, using the TAA to an ILS is as simple as loading the ILS approach because the waypoints for the TAA will be included. If you’re still squeezing the life out of an antique GPS that’s terminal only, like the Apollo GX55 in one of the planes I fly, you can’t load approaches, but you can still use its RNAV-1 capability for this approach. The waypoints will be in the database, so if you were approaching from the east via JIBGO, you could enter direct JIBGO and tune the localizer. Navigate via GPS until you’re on the localizer and use the GPS to identify crossing JIBGO. If you were approaching from the northwest, you’d add both ZENKO and JIBGO to your flight plan so you could fly direct ZENKO and then track to JIBGO and then the localizer. That’s not cheating. That’s legitimate use of a terminal GPS that has no approach capability. If you had no GPS, you could get vectors onto the localizer. This removes the need for the TAA. However, you’d still need to identify JIBGO to know when a descent to 3700 was allowed. Apparently, ATC can’t help you out with this, or it would say “RADAR” over the JIBGO fix in the profile and plan views. Without that, you’d need DME — or at least RNAV 1 GPS, but then you wouldn’t need the vector in the first place. A similar situation exists on the missed, where you climb to 980, then make a climbing right turn to intercept MIP R-314 to ZIMEL, which is itself an intersection. With an approach GPS, you simply unsuspend navigation, switch back to GPS guidance and fly to ZIMEL. With a terminal GPS, you can still create a direct-to ZIMEL on a course of 314. This may not be an identical track to flying the VOR radial, but it’s close enough and any difference diminishes rapidly as you approach ZIMEL. With an approach-certified WAAS GPS, you’d probably skip the ILS entirely and fly the RNAV approach. There’s a pound sign for the DA of 777, which requires a cross-reference. You’ll see a higher-than-standard required climb gradient in the textual missed approach instructions, and that the inoperative table doesn’t apply in the notes. The latter is because the visibility requirement is already 3/4 miles, so you don’t need to add more if the approach lights are out of service. Speaking of cross-reference, check out all the inverse (white on black) characters on this plate. Some are simple, others require finding the associated information elsewhere. At the top of the chart, the inverse A5 by the lights in the briefing strip means this MALSR is at least partially pilot controlled. Likewise, the inverse L by the tower/CTAF frequency means there are at least partially pilot-controlled lights (PCL) when the tower is closed. How do you know the tower will close? That’s what the star after the “Williamsport Tower” in the briefing strip means. Many folks stop there but don’t be one of them. Down in the airport diagram in the lower left, you’ll see the same inverse L saying it’s the runway end identifier lights (REIL) for Runway 9 and high-intensity runway lights (HIRL) for Runways 9-27 that are pilot controlled. The star here for the medium intensity runway lights (MIRL) for Runways 12-30 means the PCL is non-standard. If you want details, you’ll have to look it up in the A/FD. There you’ll find that the approach, runway, and taxiway lights are controlled via the CTAF frequency—and that the lights for Runway 12-30 are simply off. That could be important information if you’re planning a night arrival after hours. It’s landing Runway 9-27 or going elsewhere. The inverse T and A indicate non-standard takeoff and alternate-filing minimums, respectively. This time, you’ll reference the chart supplement to see that all departures from all runways demand higher than standard climb gradients and textual departure procedure to follow. These aren’t required for Part 91 flights, but it’s a life-extending practice to comply. Alternately, you could follow the visual climb over airport (VCOA) instructions of climbing in visual conditions to 2800 over the airport before proceeding on course in any direction climbing at least the standard 200 feet per nm. The non-standard alternate minimums are another lookup, which reveals you’d better have an approach GPS if the tower will be closed, and the forecast weather better be essentially VFR. This is for filing Williamsport as an alternate, not flying there. See the sidebar below for clarification. Back on the approach chart, the inverse snowflake under the T and A means cold-weather corrections apply to this airport. This requires referencing a document many pilots don’t know exists: Cold Temperature Restricted Airports. You can find it at https://www.faa.gov/air_traffic/flight_info/aeronav/digital_products/dtpp/search/ if you scroll to the bottom of the page. Or you can subscribe to the digital document in ForeFlight. Look in there, and you’ll see the correction only applies to the intermediate legs. There’s no change to final approach minimums. Two more inverse letters and we’re done. The inverse D in the airport diagram means there’s runway declared distance information available takeoff and landing distances in the A/FD (you’re call whether the D is for “declared” or “distance”). These are the TORA, TODA, ASDA, LDA that sounds like a battle cry in an eastern language, but actually stands for takeoff runway available, takeoff distance available, accelerate-stop distance available, and landing distance available. The inverse C by the circling minimums is the simplest of all. That means the new circling radii apply, that are both a bit wider, and correct or increasing true airspeed with altitude. See IFR Focus #8 for details. Speaking of circling, note that circling south of Runway 9 and southwest of 30 is NA at night. Circling to land on Runway 12-30 is also NA at night. These prohibitions are usually because of close in obstacles obstacle you’re expected to avoid visually. If you’re wondering what those obstacles might be, you can find a list after any takeoff minimums and obstacle departure procedures. This might take some time. Williamsport has one of the longest lists of low, close-in obstacles I’ve ever seen. Maybe the FAA survey folk were getting paid by the word. 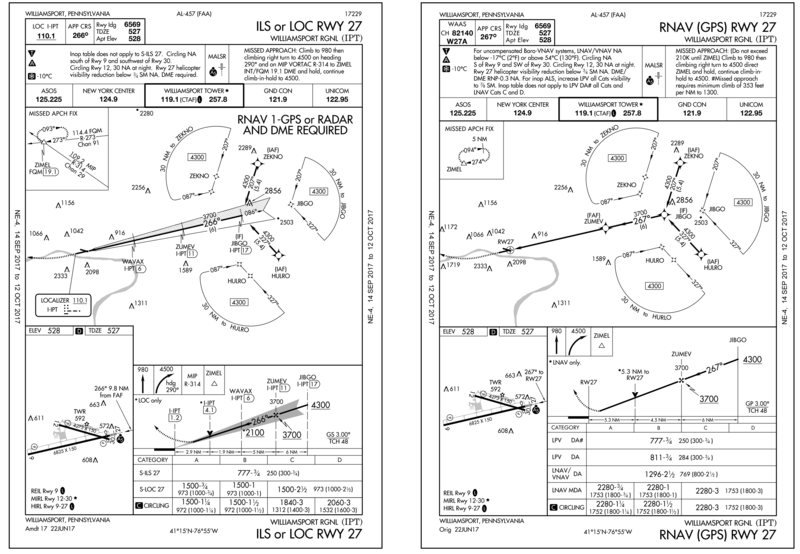 Approach charts like these are a boon to the designated examiner pushing the bounds of a candidate’s knowledge on an instrument checkride: “What’s the minimum safe altitude (MSA) for this approach?” Search as you may, you won’t find the familiar circle with its 25-mile ring of safety on this chart. That’s because its equivalent is staring you in the face: The TAA extends out 30 miles from each reference fix with a safe altitude to fly. A published MSA would be superfluous. When you’re viewing an approach chart in ForeFlight, what’s the fastest way to see other approaches for that same airport? A. Close the chart, type the identifier for the airport in the upper right, select the new airport from the list. B. Load the airport full screen in the Airports tab, then select the other approach from the list of procedures. C. Swipe left or right on the full-screen approach chart with three fingers. D. It depends on how you loaded the approach chart you’re viewing.